The Commission's planning for a new water supply began more than 10 years ago. As a member of the Tualatin Basin Water Supply Partnership, Hillsboro and its partners explored the potential for doubling the stored water capacity at Hagg Lake by raising Scoggins Dam by 40 feet. Late in 2008, the U.S. Bureau of Reclamation (which owns the dam) released findings of its seismic assessment of the dam. It concluded that a worst-case subduction zone earthquake off the Oregon Coast would exert forces on the dam that would result in a dam failure. Reclamation is engaged in a study to develop appropriate standards and designs for improving the dam and improving its ability to withstand a seismic event. The costs and delay associated with those dam modifications create significant uncertainty for the dam raise project. In response to that uncertainty, the Utilities Commission began a Water Supply Study (Study) in 2010 to identify a water source that could best meet the projected 40-year increase in demands of Hillsboro and neighboring water suppliers, and also adhere closely to the local community's values and expectations for its high quality, reliable water supply. The Utilities Commission used various approaches to engage the community throughout its study. The following sections summarize these efforts. Polling and Focus Groups: The Commission retained the well-respected firm of Davis Hibbitts & Midghall (DHM) to measure the public's awareness, knowledge, and perceptions of water supply issues, and to gather factors they would want the Commission to consider in selecting a new supply source. DHM conducted a scientifically-based telephone survey of Hillsboro Water customers, and conducted four focus group (FG) sessions also with Hillsboro Water customers. Quality of Water Source: Participants expressed satisfaction with their current water quality and water source, and wanted any new source to maintain the current level of quality. 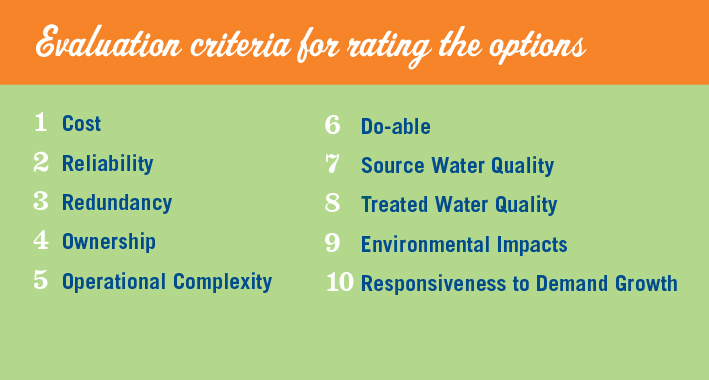 Cost: Participants viewed cost equally or only slightly less important as quality of the water. Reasons included the rising cost of living and the negative impact that cost increases could have on businesses, farmers, low-income families, and seniors living on a fixed income. Political Control: Participants in both groups agreed that any option that would take away political control over their water source and rates away from Hillsboro should not be considered. Website: The Commission developed the first phase of this website and devoted it entirely to information about the water supply study. Utilities Commission customers were notified of the website through bill messaging and informational card distribution. The cards were produced in both English and Spanish. The website includes information on the current water supply system, the different options under consideration for long term supplies, and water conservation measures. The website also provides information on interim and short range options for small increases in water supply capacity that may cost-effectively maximize the utilization of existing supply sources. The site also provided a mechanism for commenting or asking questions about the project. Coordination with Partners: Throughout the study, Hillsboro included neighboring water supply agencies to advise, provide technical guidance, and review the data that was developed. Participants on the Technical Advisory Committee included Tualatin Valley Water District, Clean Water Services, and the cities of Beaverton and Forest Grove. Including these agencies in the study process was designed to assure that the long-term water supply needs of the entire Joint Water Commission service area would be reflected in the analysis. Public Information: Water Department staff kept the City Council advised of the options that were under study by the Utilities Commission, with briefings to the Council at two public work sessions. Staff also made presentations to a number of local groups, including the Washington County Public Affairs Forum, the Greater Hillsboro Chamber of Commerce, and Hillsboro Rotary Club. Staff distributed information about water supply questions and the water supply website to the public from its booths at numerous public events, including Public Works Fair, Tuesday Markets, Celebrate Hillsboro, Hillsboro Air Show, and Washington County Fair. The postcards are also available around town at such locations as Utility Billing, Outdoors In, Aquatic Center and both Hillsboro Library locations. The Spanish version is also available at the Centro Cultural, the Latino cultural center located in Cornelius. The Commission used a combination of surveys and focus groups to measure the public's awareness, knowledge, and perceptions of water supply issues, and to gather factors they would want the Commission to consider in selecting a new supply source. The Commission also instructed staff to provide information on the water supply study through a special project website. Additional public input was solicited through the website and at interactive events throughout the City. The three-year water supply study yielded detailed technical memorandums on different aspects of the project. The memos, plus an additional study on potential development of local groundwater, are available for review on the Resource Library page. 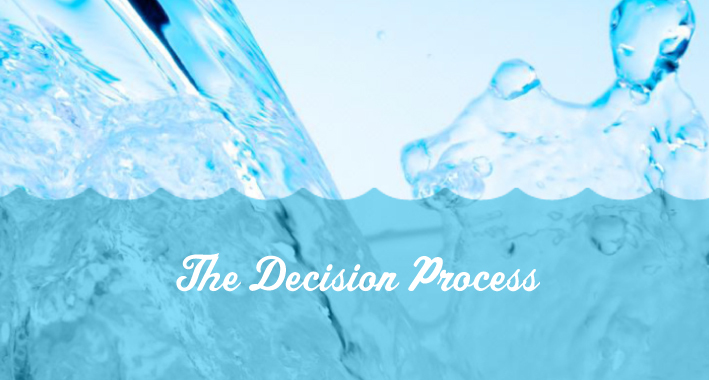 This compilation of information was critical to the decision-making process undertaken by the Commission to designate a future water source that best met Hillsboro's future supply needs and community values. Under the City Charter, the Utilities Commission is granted full authority over the management and operation of the city's water system. One of its most important responsibilities is to plan for and secure adequate sources of water supply to assure that the long term needs of the community will be met. Previous Commissions have left a strong legacy of successfully meeting that challenge. The Commission has some of the oldest, most senior water rights in the Tualatin River basin. The Commission was a participant in the construction of Scoggins Dam, spearheaded the construction of Barney Reservoir, and participated in the expansion of Barney Reservoir. Hillsboro's share of the stored water in those reservoirs provides vital flows during peak summer months to supply the community's needs. The current Utilities Commission is committed to securing a high-quality and reliable water supply for the future generation. Their hope is that in 50 years they will be credited with continuing the legacy of leadership in local water planning. Overall cost of the option including cost to both build and then operate the supply, expressed in risk-adjusted Net Present Value. Ability of the option to consistently deliver needed water, including consideration of events with the potential for causing water supply shortages, such as droughts or earthquakes. Ability of the option to provide an additional, independent water supply. Ability of the City to control decisions regarding supply improvements, operations, and costs. Potential level of difficulty in running a water supply and treatment system that maintains Hillsboro's current high level of service quality. Risk that the project would not be completed on time, or at all, due to unforeseen circumstances, political roadblocks, or level of project complexity. Fewer potential sources of contamination located upstream of option. Ability of treated water to meet a standard of quality comparable to treated water currently received by the City. Environmental impacts due to construction and/or operation of the supply. Ability to supply full projected growth in demand, and phase improvements in response to slower or faster growth. The Commission rated each potential source (other than Durham, which had been eliminated due to the unavailability of water rights), based on a set of criteria. The criteria, based on community needs and values, were chosen by the Commission after receiving input from staff and the general public. Each potential source was rated independently. The source that best matched the list of community criteria was selected as the preliminary preferred alternative. However, none of the sources (other than Durham) were eliminated. Instead, all other potential sources are considered “sidelined” while the public outreach effort is made. If a fatal flaw (reason that the project cannot continue) is discovered with the designated option, the other source options will again be considered. In June 2012, the Commission received the Technical Memorandum on cost estimates for construction, operation, and maintenance of each option. The estimates were based on construction and operation of project configurations to meet the needs of the entire partnership. For project elements that could be built in phases, such as treatment plant capacity, the estimates included phasing assumptions, to realistically spread the cost of construction over time in response to the need for additional capacity. Capital, operation and maintenance costs were then adjusted for the time value of those expenditures to calculate a net present value (NPV) in 2012 dollars. The NPV allows the options to be compared directly based on their total life cycle costs. In addition, the cost estimates were evaluated for cost risks. Actual construction or operating costs may be higher or lower than the original estimates, due to inflation, bidding market, the completeness and complexity of design, or a variety of other factors. After assigning risk ranges to different project elements, each option was subjected to intense analysis. Twenty thousand different scenarios were evaluated for potential future conditions, by randomly selecting cost values for each project element from a probability distribution rather than using a single point value. While the numbers are still just estimates, they are accurate estimates, and provide the best information available for determining project costs in relationship to each other. The Utilities Commission measured each potential source option against the set of 10 criteria that was selected by them after receiving input from their staff and customers. The Mid-Willamette option was the least expensive option, had the most positives and was the only option that successfully met all of the criteria. 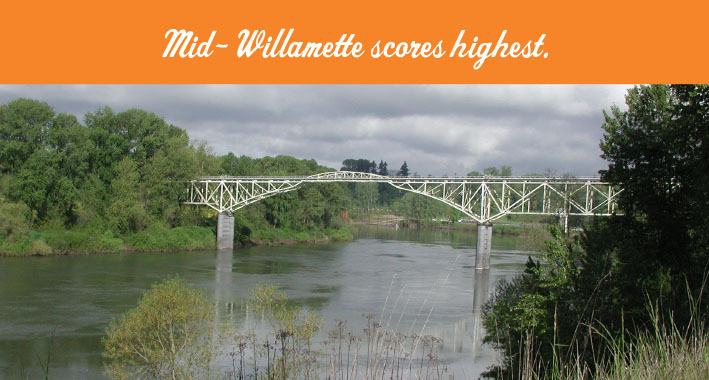 Here are detailed explanations why the mid-Willamette scored so highly and came out on top as the preliminary preferred option. Treated Water Quality: The highest priority for the Utilities Commission is to protect customer health by consistent delivery of high-quality drinking water. Water drawn from the Willamette River would be treated to the highest standard available and would consistently meet or surpass all Safe Drinking Water Act standards. The high quality of the treated drinking water from the Mid-Willamette source has been confirmed by the experience of two communities that already receive their drinking water supplies from this source. Wilsonville has been getting all of its drinking water from the Mid-Willamette source for 10 years, and Sherwood recently converted its water system to be dependent on this source. Wilsonville has met all drinking water standards over the last 10 years. 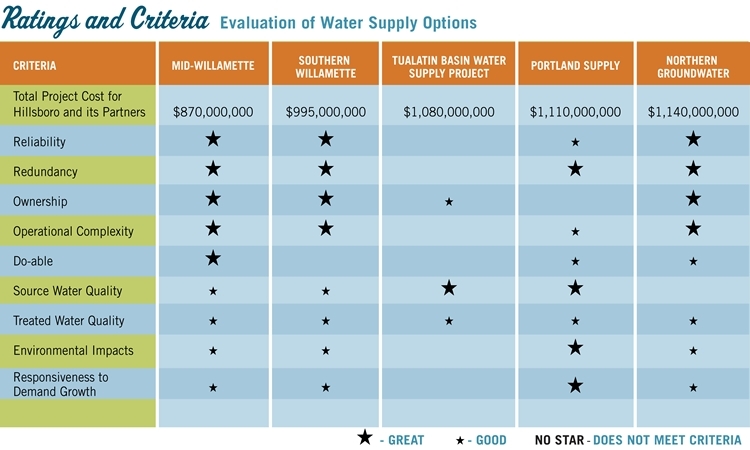 Reliability: The Mid-Willamette option has a positive rating compared to most of the other options. It is less susceptible to impacts from drought or climate change because of the large size of the watershed above the diversion point, and the large number of storage impoundments upstream of this source. The reliability of this option is also increased in comparison to some of the other options because the new treatment plant and transmission facilities would be built to current seismic standards. 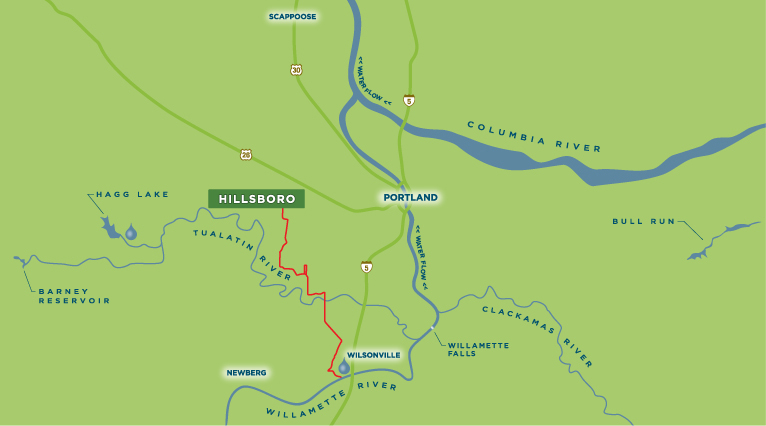 Redundancy: The Mid-Willamette option provides an additional source of water supply for Hillsboro. It shares this benefit with all of the options other than the Hagg Lake expansion option. Currently, Hillsboro is entirely reliant on its single source of supply through the Joint Water Commission and the Tualatin River basin. Ownership: Hillsboro's history of successfully planning for the challenges of meeting its water supply needs have depended on its ownership interests in all the elements of the water supply system, beginning with its water rights and stored water facilities, and continuing through ownership of the treatment and transmission facilities. It was also clear from input received from Hillsboro's water customers that they place a high value on the ability of the city to own and control its water rights and infrastructure. The Mid-Willamette option provides the Commission with the same opportunity for asset ownership that has been effective for the city through the Joint Water Commission. Operational Complexity: Hillsboro currently operates the largest conventional water treatment plant in Oregon, and a water transmission system that serves over 400,000 residents across Washington County. The treatment and transmission systems for the Mid-Willamette option would be similar in configuration and sophistication to the system already operated by the city. (2) since the risks associated with obtaining approvals to build a new raw water intake are high, the Mid-Willamette option rates higher because an intake is already in place and there is no need to build a new intake. Source Water Quality: The Mid-Willamette option was rated neutral for this criterion. These facilities would be taking water from the Willamette River well upstream of the Portland metropolitan urban area and the Portland Harbor superfund site. Upstream of the Mid-Willamette facilities is a relatively large watershed, which increases the risk of potential contamination from urban and rural influences. However, this option benefits from the extensive water quality database and monitoring system that is available for the Willamette River. Hillsboro is committed to source water protection programs and emergency response planning for any water source option. These programs allow for potential risks to be addressed through design of treatment systems and operations and through proactive watershed management. Environmental Impacts: All of the options involve some environmental impacts. The impacts associated with the Mid-Willamette option are neutral compared to the other options. Most of its impacts would occur during construction and could be mitigated; since there is no need to build a new raw water intake, the impacts of in-river construction work are minimized. Impacts from power usage during plant operations are moderate compared to some other options. Responsiveness to Demand Growth: Water treatment plant capacity for the Mid-Willamette option could be built in phases as the need for water increases. This option also holds the potential for additional long-term expansion beyond the planning period that was addressed by the water supply study. 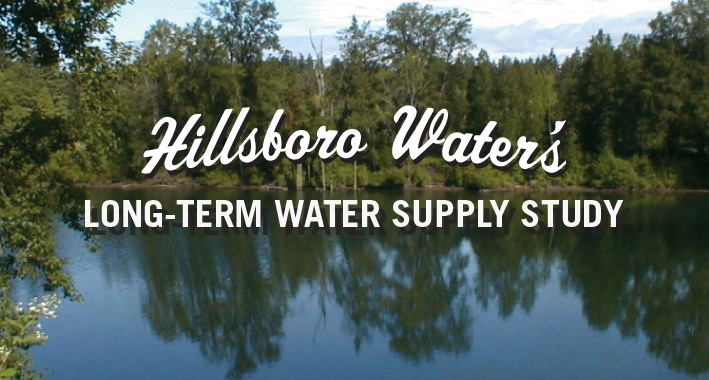 The City of Hillsboro Utilities Commission has identified the mid-Willamette as the preferred additional water source for the next generation of Hillsboro residents. 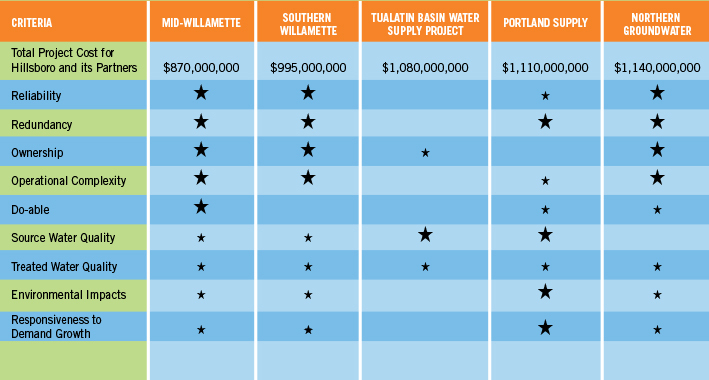 For two years, Hillsboro Water (HW) studied possible alternatives for a long-term supply that will be ready to serve customers around 2026, and the mid-Willamette option best matched the values identified by Hillsboro customers and commissioners as most important to the HIllsboro community. Before designating the mid-Willamette as the preferred alternative, the Utilities Commission held multiple community conversations about water supply in Hillsboro. If you know of a group that would like to learn more about Hillsboro's future water supply, please call (503) 615-6702 and we will work with you to set up a presentation. Presentations usually range from 30 minutes to a full hour, but we are happy to fit into your schedule. If you are unable to attend an outreach event, but would still like to comment on the Willamette Water Supply Program, please click here to be linked to an online comment form. Public Outreach Program: At the Utilities Commission meeting on September 18th, designated the mid-Willamette as the Preliminary Preferred Source and initiated a public outreach program from late September through early December. Through several interactive public workshops and other sessions with customers and stakeholders, the Commission will solicit input on questions or concerns that the public may have about the Preliminary Preferred Source, and on the evaluation criteria considered by the Commission. The Commission will also collect and consider any comments submitted through the water supply website. On January 8, 2013, the Water Department staff will deliver a report to the Commission of the feedback received during the outreach program. The Commission will also hold a public hearing that same evening to receive any input from community members who want to directly address the Commission. Final Designation of Preferred Source Option: On February 12, 2013, the Commission is scheduled to make a final decision on the Preferred Long Term Water Supply Source. That designation will be included in adoption of the Commission's Water Master Plan Update. Study of the Preferred Source Option will continue after February. Designation of the Preferred Source will not result in an immediate launching of design and construction. Instead, study will continue, but now focused only on one option instead of on multiple potential supply source options. The continuing study will address concerns raised during the public outreach process, as well as coordination with potential partners on timing of the expansion and related issues. If the study and coordination efforts identify a fatal flaw (reason that the project cannot continue), then the Commission can return for a new consideration of the previously sidelined options. Acquisition of right-of-way for transmission pipeline will begin. All of the options require the construction of lengthy transmission pipelines. Purchasing property or easements for a lengthy pipeline alignment can be a challenging and time-consuming process. It is important to begin that process soon to protect access to critical alignment corridors from encroachments by development or other improvements.